Garlic Scapes to the Rutscue! I am a sucker for a good rut! I fall into one and, before I know it, we have been eating the same three meals on a rotating basis everyday. This could go on for weeks until I realize, “Whoops! I’ve done it again.” After I realize I have fallen into a rut, I usually try to avoid whatever food item (or group) we have been living off. This is a slight exaggeration, but basically true. When it comes to cooking, I usually like to stick to tried and true recipes. It is easier, after all, than searching for new recipes online, making sure I have all the ingredients, trying to read the recipe on my handy-dandy phone, and then prepare the new recipe all the while simultaneously trying to keep two toddlers happy right before dinner (ahem- bed) time. Yes, that’s my life and that is why I find myself falling into mealtime ruts on a regular basis. It is much easier to just throw a few ingredients together for a recipe I already have memorized than juggle the fiasco that ensues whenever I decide to cook a new recipe. Even healthy ruts are still ruts. Our bodies need a variety of foods and sticking with one food (or food group) too long can be unhealthy, not to mention boring. My tendency for falling into ruts is one reason why I am so thankful to be a part of a CSA (Community Supported Agriculture). It forces me to be creative. We eat what is in season, and so the types of food I have in our fridge is constantly changing. For dinner tonight we had garlic-herb roasted chicken, kale with spring onions, and diced turnips with garlic scapes. Yes, that is one meat with a whopping four veggies in one meal. It was delicious and, yes, both of our toddlers ate it with gusto. I had heard of (but never cooked with) kale, onions, and even turnips before we decided to switch to eating more wholesome foods. Once we switched over to a more wholesome diet, kale, onions and turnips became staple items in our home. 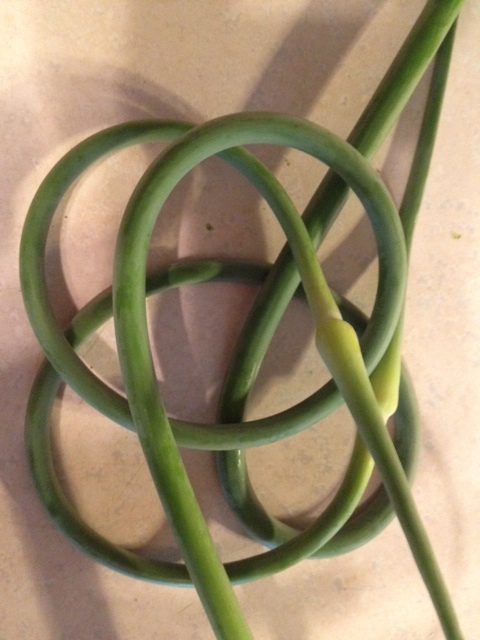 However, I had most definitely never heard of garlic scapes before last week’s trip to our farmer’s market stand. I grabbed a few as a part of our share and came home and promptly ruined a perfectly good batch of garlic scapes by trying to roast them in the oven. Perhaps my ratio of scapes to oil was off or maybe I cooked them too short or long in the oven. Whatever the reason, it was enough for our family to wonder why on earth everyone at our CSA was raving about garlic scapes. I decided to give garlic scapes one more try this week and I am so glad I did. They were incredible! All I did was saute them in a bit of butter and olive oil with salt and pepper along with some turnips (I chopped and boiled the turnips to soften them a bit before adding them to the scapes). After ten minutes or so I added a half cup of homemade chicken stock and cooked the mixture till the stock reduced to a glaze. My O my, were they tasty! If you have never had them before, they taste like a cross between asparagus and green beans- only much, much better (and that is saying a lot coming from me- I am a passionate fan of asparagus!). With little to no fat, garlic scapes are loaded with fiber, calcium, iron and vitamin C. Have a look at the picture below to see what I am raving about and then go out and try some! Garlic scapes are a fabulous way to pull yourself out of whatever meal rut you may find yourself in and spice up your meals! They are a great addition to many dishes (especially mashed potatoes) and I have heard they make a great pesto! If you want an even easier recipe for scapes than the one I shared above, simply cut the scapes into the desired size pieces and saute them in butter/olive oil and a bit of salt and pepper for ten minutes or so. Delicious! Garlic Scapes! Cook them like this or chop into desired sized pieces!